What Happened When Modern Humans Met Neanderthals? In short, they interbred, according to Svante Pääbo, a Swedish biologist and pioneer of paleogenetics, the study of preserved genetic material from the remains of ancient organisms, including ancient human DNA. He has served as director of the Department of Evolutionary Genetics at the Max Planck Institute for Evolutionary Anthropology in Leipzig, Germany, since 1997. He explains in this lecture that Neanderthals and Denisovans have a common ancestor in Africa. About half a million years ago, these species of humans came out of Africa and evolved into what we call Neanderthals in Western Eurasia and Denisovans in Eastern Eurasia. Much later modern humans appeared in Africa and then spread, initially to the Middle East, then to Eurasia where they encountered Neanderthals and Denisovans. Eventually, those earlier species became extinct, replaced by modern humans. Pääbo’s lab famously retrieved and sequenced ancient Neanderthal DNA and produced a high-quality genome sequence that allowed for the reconstruction of the recent evolutionary history of our species. Once the genome was sequenced and studied it became apparent that ancient and modern humans interbred. In fact, most present-day humans have some Neanderthal DNA. 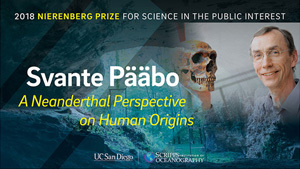 Svante Pääbo’s was selected by Scripps Institution of Oceanography at the UC San Diego as the recipient of the 2018 Nierenberg Prize for Science in the Public Interest. He gave this fascinating lecture on that occasion.